Janakpur ([dʒəŋɑkpʊr] Nepali: जनकपुर) is the capital of Dhanusa District in Nepal. The city is a centre for religious and cultural tourism. The city is also known as Janakpurdham, which was founded in the early 18th century. According to oral tradition, an earlier city existed in the area, also known as Janakpurdham, which was the capital of the Videha dynasty that ruled Ancient Mithila. The city is located about 123 km (76 mi) south-east of Kathmandu. As of 2015, the city had a population of 169,287. The Nepal Railways operates between Janakpur and India. Accounts of ascetics, pandits and bards indicate that Janakpurdham was founded in the early 18th century. The earliest description of Janakpurdham as a pilgrimage site dates to 1805. Earlier archaeological evidence of the presence of an ancient city has not been found. According to the Hindu epic Ramayana, King Janak of Videha's palace was located in ancient Janakpur, the capital of the Videha Kingdom. He is said to have found a baby girl in a furrow, called her Sita and raised her as his daughter. When she was older, he offered her in marriage to anyone who was able to lift the bow of Shiva, left near Janakpur a thousand years earlier. Many royal suitors tried, but only Rama, prince of Ayodhya, could lift the bow. According to an old song, this bow was found northeast of Janakpur. Until the 1950s, Janakpur was a cluster of rural hamlets inhabited by farmers, artisans, priests and clerks who worked for the monasteries that controlled the land. After independence in India, Janakpur expanded to a commercial centre and became the capital of the Dhanusa District in the 1960s. As Rama and Sita are major figures in Hinduism, Janakpur is an important pilgrimage site for Hindus all over the world. According to the first millennium text Shatapatha Brahmana, the Maithil king Māthava Videgha crossed the Sadānirā (Gandaki River), led by his priest Gotama Rahugana, and founded the Kingdom of Videha with Janakpur as capital city. As Gotama Rahugana composed many hymns of the Rigveda, these events must date to the Regvedic period. Gautama Buddha, the founder of Buddhism, and Vardhamana Mahavira, the 24th and final Tirthankara of the Jain religion, are said to have lived in Janakpur. The region was an important centre for history of Mithila during the first millennium. Janakpur is located in the Terai, where the climate is tropical: the months of April to June are hot, dry and windy; rainy season lasts from July to September, followed by a cool dry season from October to January and a short spring from February to March. The major rivers surrounding Janakpur are Dudhmati, Jalad, Rato, Balan and Kamala. Janakpur is one of the fast developing cities of Nepal, and is the fifth sub-metropolitan city of Nepal. The city has good health care facilities, and a number of parks as well as good private schools, colleges and internet service providers. There are medical and engineering colleges which are affiliated to the Tribhuvan University. The economy is mostly based on tourism, agriculture and local industries. Janakpur attracts migrants from the surrounding area, moving to the city for medical care, education and jobs. The largest employer was the Janakpur Cigarette Factory Limited and Janakpur Railway until 2013, now both are closed due to political corruption. As per the 2011 census, Janakpur was home to around 97,776 people. Nevertheless, after it was declared a sub-metropolitan city in 2015 incorporating 11 surrounding villages, this has soared to 169,287 people, making it the sixth largest city in Nepal. Maithili language is widely spoken in the area as the first language. Nepali, Hindi, Marwari and English are well-understood. Languages like Bhojpuri and Awadhi are understood but less frequently used. 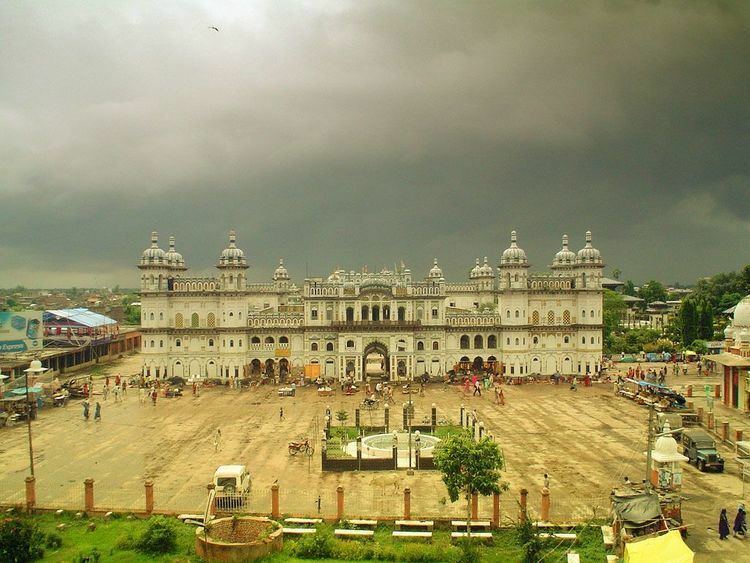 The centre of Janakpur is dominated by the impressive Janaki Mandir to the north and west of the bazaar. This temple, one of the biggest in Nepal, was built in 1898 (1955 in the Nepali calendar) by Queen Brisabhanu Kunwari of Tikamgarh. It is also called "Nau Lakha Mandir" after the cost of construction, said to be nine lakh rupees. In 1657, the great saint and poet Sannyasi Shurkishordas discovered a golden statue of the Goddess Sita at the place where she was born, which ultimately became the location of the current Janaki Mandir, the Temple of Sita. Queen Brisabhanu Kunwari of Tikamgarh had the Janaki Mandir built in 1911. The temple is architecturally unique in Nepal. Its inner sanctum contains a flower-bedecked statue of Sita that was apparently miraculously found in the Saryu River near Ayodhya. Statues of Rama and his half-brothers Lakshman, Bharat and Satrughna stand by Sita. In the early evenings the temple is lit with colourful lights and filled with hundreds of pilgrims expressing devotion for Sita and Rama. Adjacent to the Janaki Mandir is the Rama Sita Bibaha Mandir, a building that marks the place where Rama and Sita were married. The oldest temple in Janakpur is Sri Ram Temple, built by the Gurkhali soldier Amar Singh Thapa. Pilgrims also visit the more than 200 sacred ponds in the city for ritual baths. The two most important, Dhanush Sagar and Ganga Sagar, are located close to the city centre. The Vivah Mandap temple is situated next to the Janaki Mandir. Ram Tower is located to the south of Ram Temple. It was inaugurated by former Prime Minister Sushil Koirala. Major religious celebrations include the Hindu festivals Dipawali, and Vijayadashami, followed by Chhath Puja and Makar Sankranti six days after Dipawali. Local people celebrate both festivals in a carnival-like atmosphere. On the full moon day of February/March before the festival of Holi, a one-day Parikrama (circumambulation) of the city is celebrated. Many people offer prostrated obeisances along the entire 8 km (5.0 mi) route. Two other festivals honor Rama and Sita: Rama Navami, the birthday of Lord Rama, in March-April, draws thousands of pilgrims. The Vivah Panchami or Vivah festival re-enacts the wedding of Rama and Sita at the famous Vivah Mandap temple on the fifth day of the waxing moon in November or early December. Janakpur has good educational facilities and several elites of the country were schooled here, including the first president of the Federal Republic of Nepal, Dr. Ram Baran Yadav. There are many private and government schools and colleges located in Janakpur. The oldest government school for higher studies is Ramsworup Ramsagar Bahumukhi Campus (RR Multiple Campus), which is affiliated to Tribhuwan University. It offers undergraduate and post-graduate courses in several disciplines. Janakpur also boasts of having a medical college, Janaki Medical College, which is also affiliated to Tribhuwan University. Gangasagar Public Library was established in 1955 and is situated between two historical ponds of Janakpur — Dhanuschatra pond and Ganga Sagar. The library was reopened for the public in 2012. In recent times, a team of active and committed local youth workers have contributed to the revival of this library by organizing public book collections for the library, which lacks books and English language newspapers. It is open daily for three hours, mainly for newspaper-reading, but has few daily visitors. Ramswaroop Ramsagar Multiple Campus Library is also accessible to the general public. The local media of Janakpur primarily consists of several community radio stations, some TV channels and a few print newspapers, such as Janakpur Today.